Peter Jackson was a winger of unorthodox and mercurial attacking ability who won acclaim in the back-line of England and the British and Irish Lions. 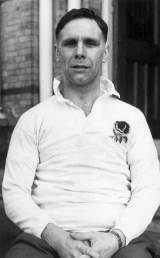 Jackson was born in Birmingham in 1930 and played for Old Edwardians and North Midlands before joining Coventry in 1954, at the height of their considerable post-war powers. Jackson's unorthodox style of attack led to him confounding opponents in each of his 20 caps for England, amassed between 1956 and 1953. He dotted down three scores during England's Grand Slam winning campaign in 1957, before securing his crowning individual moment against a touring Australia at Twickenham in 1958. With England down to 14 men and hanging on for dear life following some late and dangerous tackling from the Wallabies, Jackson received the ball deep inside England territory. Pinned against his touchline by the massed Australian ranks, Jackson set off on a jinking run that saw him evade the flailing bodies of the opposition to dash the length of the field to score. Wallaby full-back Rod Phelps was powerless to stop the flying Jackson in the corner, being beaten not once, but twice during his run. England hung on to triumph 9-6. Following his heroics at Twickenham Jackson embarked on a British and Irish Lions tour in 1959. Jackson's considerable talents led to him achieving great success on tour, and he crossed for 14 tries in 16 matches whilst in New Zealand. Having been dropped by England in 1960 due to an apparent lack of pace, it took Jackson three years to regain his place. He returned to the white shirt in Cardiff against Wales in 1963, and was instrumental in a length-of-the-field score for England in treacherous conditions. Following his retirement from the game Jackson became involved in the administrative aspect of the game and subsequently served as fixture secretary, club secretary and finally president of Coventry.